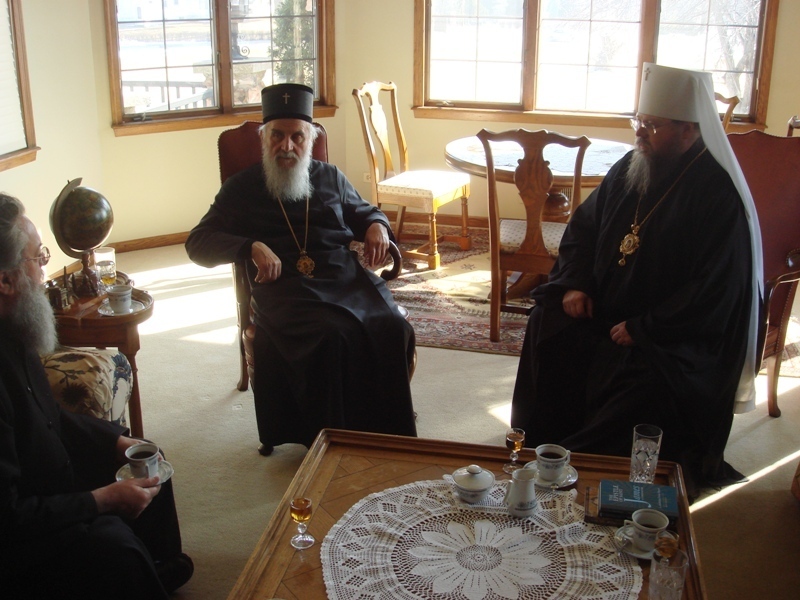 Libertyville, IL - On Tuesday, March 1, 2011, His Holiness Serbian Patriarch Irinej met with a delegation of the Orthodox Church in America headed by His Beatitude Metropolitan Jonah of America and Canada in the Episcopal Residence at St. Sava Monastery in Libertyville, Illinois. His Grace Bishop Longin of New Gracanica and Midwestern-America (SOC), His Grace Bishop Tikhon of Philadelphia and Eastern Pennsylvania (OCA) and Bishop-Elect of Chicago and the Midwest Archimandrite Matthias (OCA) also were present at the meeting. 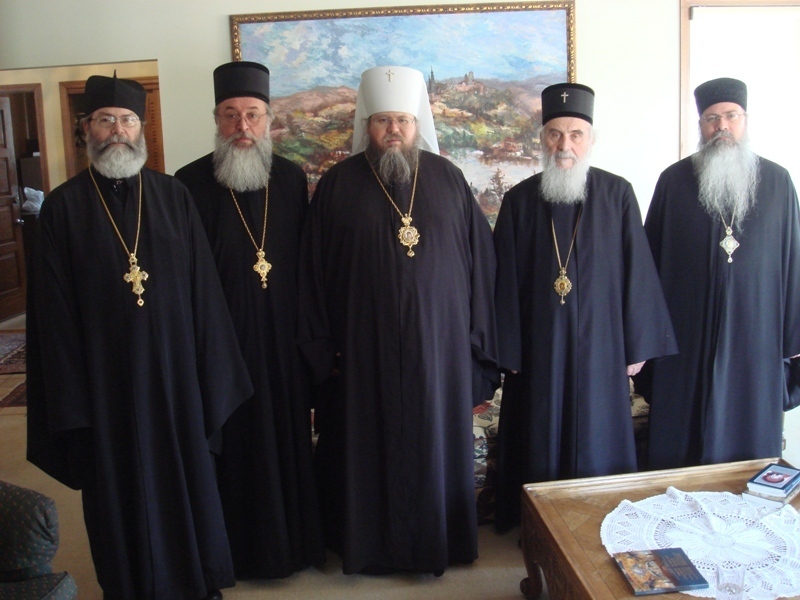 The OCA delegation was warmly welcomed by Patriarch Irinej. The meeting lasted just under two hours in a spirit of brotherly love and trust. Several topics were discussed, including church order on the North American Continent, pastoral issues and other matters concerning the church life of both Churches. 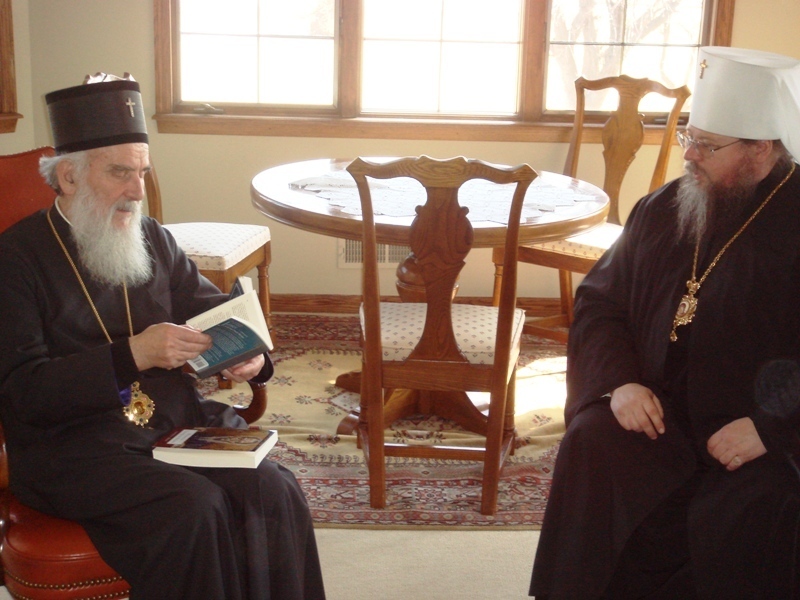 At the end of the meeting, His Holiness gifted Metropolitan Jonah with a commemorative book of the iconography of Holy Resurrection Serbian Orthodox Cathedral in Chicago, and His Beatitude gifted Patriarch Irinej with several newly published books by St. Vladimir’s Seminary Press. After the meeting, the OCA delegation was taken on a tour of St. Sava Monastery and New Gracanica Monastery in Third Lake, Illinois, where the members venerated the local holy sites.